The SLO CAL sun doesn&apos;t dim in the off-season. Enjoy all the sand, surf and sights associated with SLO CAL beaches October through May. Think great weather, less crowds and a breath of fresh salty sea air. Break out the Best of the Beach Boys and hop in! We&apos;re going to the beach. Chill out (for real). 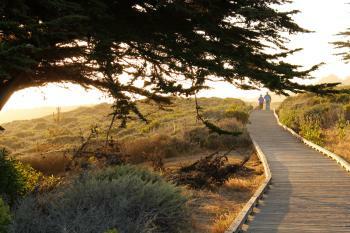 The dramatic meeting of pine trees and untouched white sand beaches make Cambria a romantic must-visit. Each fall, community-crafted scarecrows dot the antique town square during the Cambria Scarecrow Festival and the fabulous farm-to-table restaurants are gleefully chill. In January, take your pick of the three-day Art & Wine Festival or attend watch over 150 films during the Cambria Film Festival in February. No matter what month you decide to come, Cambria will be the picture of relaxation and a calming vacation. Cayucos, the friendly, welcoming beach town along Highway 1 is also a great choice for a seaside getaway. Bring Fido and roam the dog-friendly Cayucos State Beach for seashells or venture further south and try standup paddle boarding/kayaking in Avila Beach, where the water (and vibe) is equally as calm. 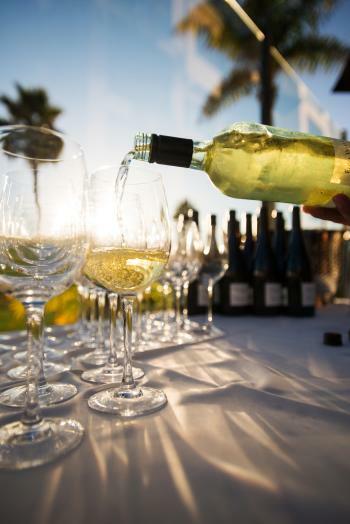 Wineries, breweries and distilleries dot SLO CAL&apos;s coastal towns. Up your relaxation vibes with a tasting flight, tour or just simply relax. Explore more, here. Take the road less traveled this winter and have Highway 1 all to yourself (or a date). Start in Grover Beach where you&apos;ll be able to drive onto the sand, start up a bonfire and watch the sun paint beautiful colors across the SLO CAL sky. Meander up the coast to Morro Bay to explore the estuary, laid-back seafaring vibes and watch surfers take to the waters near Morro Rock. 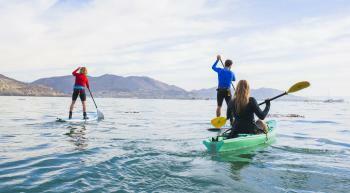 Travel further north and watch as SLO CAL&apos;s world-famous slice of coastline changes. Don&apos;t forget to eat! Stop for a bite at Tognazzini&apos;s Dockside Two in Morro Bay, Schooners in Cayucos, Robin&apos;s Restaurant in Cambria or the Ragged Point Inn. Yes, all the same sights are celebrated throughout the offseason! 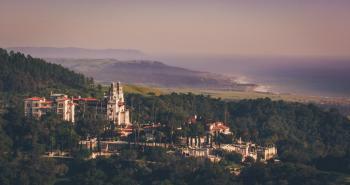 Historic Hearst Castle, one of SLO CAL&apos;s most prized destinations, attracts visitors from around the world. Tour the dreamlike terraces and picturesque pools while grabbing that perfect photo to remember it by. Not far from Hearst Castle, the tiny (literally) town of Harmony is just as charming during the fall and winter as it is in spring—stop by to see glass blowers and check out the chapel and post office. Looking for a family activity that&apos;s also adventurous? Rent a couple of ATVs in Oceano and kick up sand while revving up and down the beach and at the Oceano Dunes State Vehicular Recreation Area. Ready to chill out? View thousands of monarch butterflies at the Pismo Beach Monarch Preserve (best viewing is late October through February) or trot on horseback through Montaña de Oro&apos;s gorgeous tide pools. The Piedras Blancas Elephant Seal Rookery is the only elephant seal rookery in the world that is easily accessible, free and open to the public all year. Seven miles north of San Simeon on Highway 1, it is a sight to behold from December-March. This is a West Coast wonder on display, just as nature intended it. Each January brings SLO CAL Restaurant Month, a blessing for your taste buds and your wallet. During this magical time, a marvelous multi-course prix fixe meal can be yours for just $30-$40. Snag a table on the water in Morro Bay or Avila Beach, where fresh seafood is hauled in from the pier daily. Check out the amazing array of regional stays and pick something perfect for your personality. Whether quirky, romantic, with a fire pit, near a coastal tasting room or right on the water—you&apos;ll find a stay in SLO CAL that&apos;s perfectly suited for your budget. Check out our deals page for packages and promotions.